As you already know I love p2 polishes. They’re not available in my country, but every once in a while kind soul brings me few polishes from Germany, so my collection is growing. I gathered all of my p2 polishes as I was updating my list, when I got the idea to show you my beauties. I’ll probably never manage to swatch all of them, so you can at least see the color in the bottle. Most of the polishes that we did swatch can be found in p2 gallery. p2 also released few new shades under the same name previous shades wore. Unlike the Essence/Catrice their numbers are unique for each polish. So you have old Glamour (no. 010) and new Glamour (no. 680). Recycling the name of the polish is not something I’m crazy about, but if they do it – I prefer the p2 way. Side polishes visible on second photo are: Silver Blast, Golden Rush and Scandal. Which p2 nail polish is your favorite? I only got one, it was a present, an i love it!!! Is there a way to order online? I also LOVE p2 nail polishes but unfortunately they’re not available in the UK. My favorite is Unforgettable, I love the teal tone and the application is always super easy! And what a great collection you have, they’re all beautiful! So pretty! Like a rainbow! My favourite one is ‘Dangerous’. I also know my sister’s favourites: they’re ‘Elegant’ and ‘Stormy’. 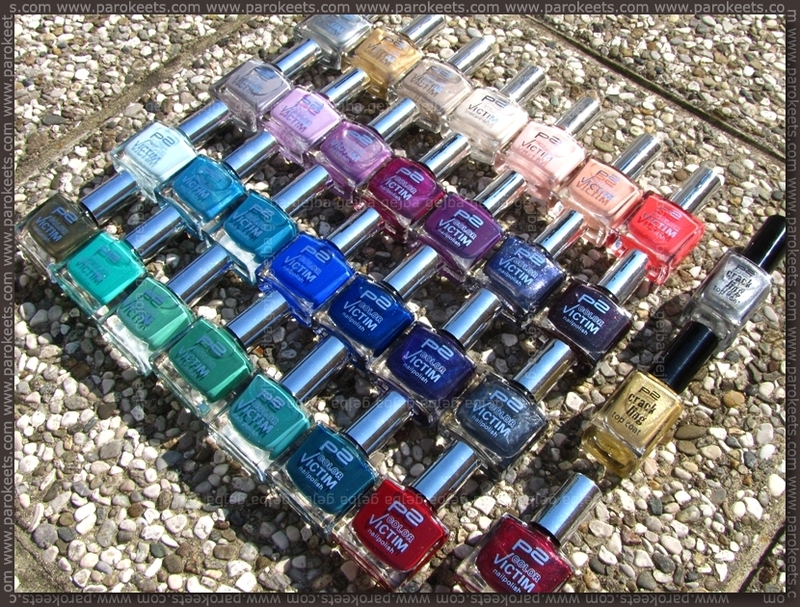 I bought several P2 polishes in Germany. They are beautiful. However, in my opinion they are a bit too watery. But the colors are fine. I like your blog. I visit ist again.